When Weight Watchers (now simply called WW) changed its point system to make more foods worth zero SmartPoints, it opened a lot of doors for zero-point recipe ideas. 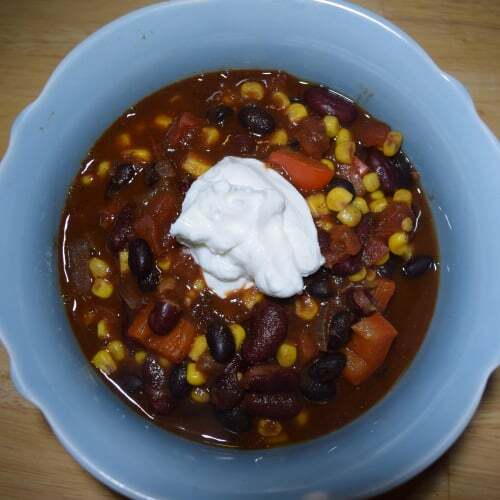 One of my favorites is a zero-point chili that’s chock-full of flavor and veggies. I make mine with no meat simply because I hate cooking the stuff, but you could make it with ground white meat chicken or turkey if you like, and it would still be zero SmartPoints per serving. I love to top my chili with a dollop of nonfat Greek yogurt to add a bit of creaminess, and even that adds no SmartPoints! You could go as far as adding some cheese and crackers or tortilla chips, as long as you keep track of your points. But if all you really want is a hearty meal without chipping into your daily points budget, stick to the recipe as is. If you want to add meat, use 1 lb. ground white meat chicken or turkey and cook it with the onions and garlic before adding in the red pepper. Spray a saucepan with cooking oil, and cook the onion, pepper, and garlic over medium heat until sweating. Because you’re using very little oil, keep stirring constantly so as not to burn the vegetables. Add the chili powder, oregano, cumin, salt, red pepper sauce, and tomatoes to the pan. Bring to a boil over high heat. Once it’s boiling, reduce heat to low and cover. Cook on low for 1 hour, stirring occasionally. Stir in beans and corn and bring back to a boil on high heat. Once boiling, reduce heat to low once more and cook for an additional 20 minutes, uncovered. Serve with nonfat Greek yogurt, if desired.